More famously known as Paltrul Rinpoche, Orgyen Jigme Chokyi Wangpo is the speech emanation of Jigme Lingpa. He was one of the greatest teachers and scholars of the Nyingma School but despite his fame he lived a life of humility and simplicity that truly embodied the teachings. It is said that five days after Patrul Rinpoche was born he was able to recite the mantra Om Mani Padme Hung and that those letters appeared as birth marks on the child's neck. From then on, like all great spiritual masters, his life was devoted to the Dharma. He spent all of his time receiving teachings, practicing in retreat and imparting his realization to others. He was continuously teaching people the mantra Om Mani Padme Hung and gave extensive explanations of Shantideva's classic text, The Way of the Bodhisattva, countless times. 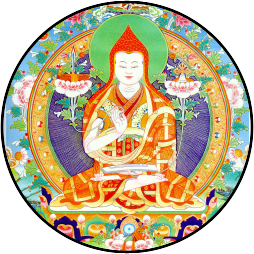 He was the main student of Jigme Gylwe Nyuku and received teachings on the Lonchen Nyingthig Ngondro (preliminary practices) from him twenty five times. Later he wrote down these teachings in the famous work, The Words Of My Perfect Teacher. This continues to be a foundational text on Vajrayana practice used by practitioners from all schools of Tibetan Buddhism today.